Barbecue Chicken Soup prepared by O’Neill Outside and Jamie Rosenthal. This version of barbecue soup is a cross between Brunswick stew and a traditional soup. It is a meal on its own but can also be served in small portions as a first course. Though the recipe calls for leftover Beer-Brined Chicken, roasted turkey, beef brisket or shredded pork would work just as well. For a real treat, serve this with cornbread. Fishing, hunting — if it’s related to the outdoors, O’Neill Williams will be there! 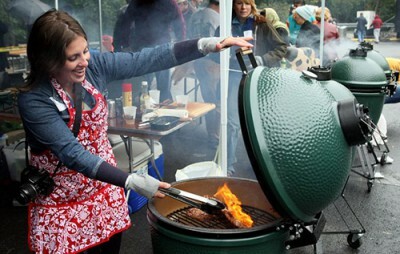 Watch the “Outdoor Cooking on the Big Green Egg” segments each week on O’Neill Outside, airing on NBC Sports, SportSouth and SunSports. Check your local listings for times in your viewing area. Set the EGG for direct cooking at 450°F/232°C. Preheat the Dutch Oven on the grid for 10 minutes. Place the bacon in the Dutch Oven, close the lid of the EGG, and cook until crisp. Using a slotted spoon, transfer the bacon to a small bowl lined with paper towels and set aside. Reserve the bacon fat in the Dutch Oven. Add the barbecue rub to the bacon fat and cook for 1 minute. Add the tomatoes, onions, garlic, and chipotle and cook for 2 to 3 minutes, until the onions are translucent. Slowly add the beer to the Dutch Oven, stirring with a wooden spoon to deglaze. Add the chicken stock, ketchup, mustard, vinegar, brown sugar, and Worcestershire sauce. Leave the Dutch Oven uncovered, but close the lid of the EGG. Simmer for 30 minutes, or until the soup has thickened slightly. Remove the Dutch Oven from the heat. Puree the soup using an immersion blender, or carefully spoon it into the bowl of a food processor fitted with the steel blade, process until smooth, and return to the Dutch Oven. Add the corn, grilled tomatoes, lima beans, chicken, and pepper and stir until completely combined. Serve topped with the reserved bacon pieces.